Now that Halloween is over, it's time to start thinking about decorating for the upcoming Holiday season. I've definitely found that if my holiday decorating plans include a quilt, I have to start early before things get too busy. This quilt is currently for sale in my Etsy Shop here. 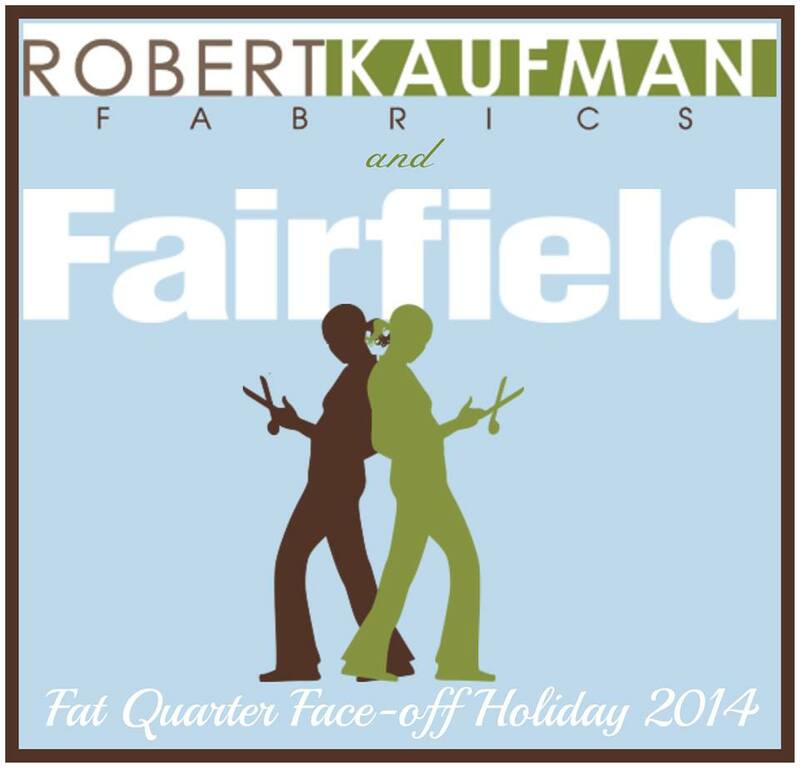 I was lucky enough to be asked to participate in the Fat Quarter Face-Off presented by Robert Kaufman Fabrics and Fairfield World. And the best part is that you get to vote for your favorite!! Okay...maybe that's not the best part. 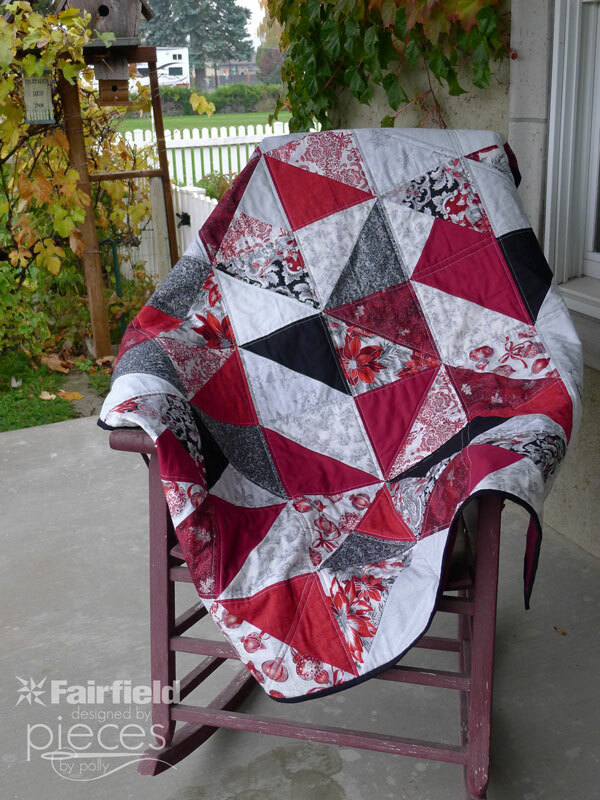 The best part is actually that I've got the free quilt pattern for you to go with it...and the other contestants have tutorials for you too. 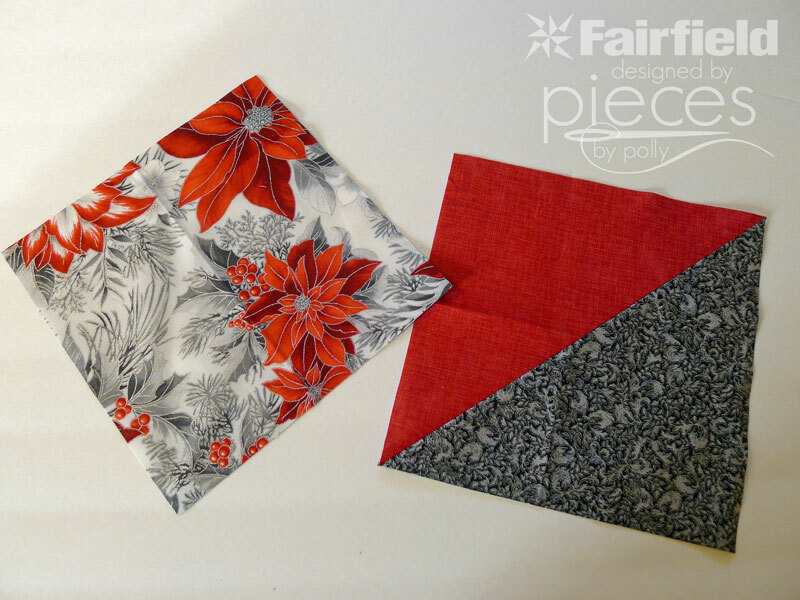 As part of the Fat-Quarter Face-Off with Fairfield and Robert Kaufman, Robert Kaufman sent me a gorgeous Holiday Flourish-Silver Colorstory Fat-Quarter Bundle. 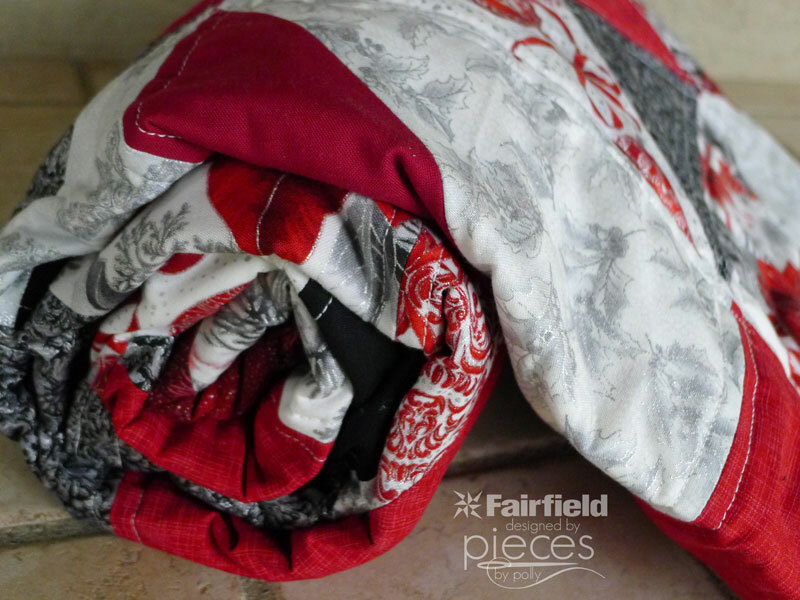 I also got to choose one Fairfield product...so of course I chose some of Fairfield World's Nature-Fil luxury blend cotton-bamboo batting for the inside. Even though I was provided with most of the materials and compensated for this post, all opinions, pictures, ideas, etc in this post are my own. And as usual, I had to do something fun with the scraps on the back. 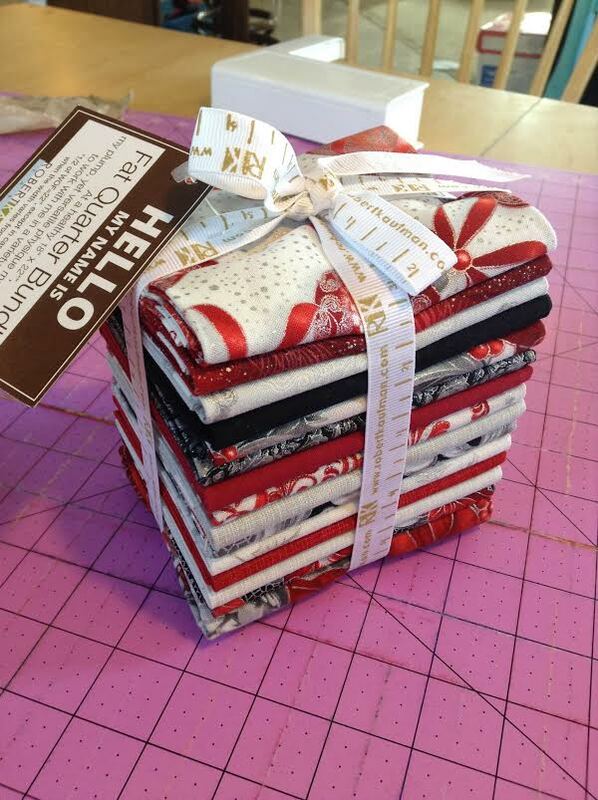 I fell in love with the Holiday Flourish bundle on sight. 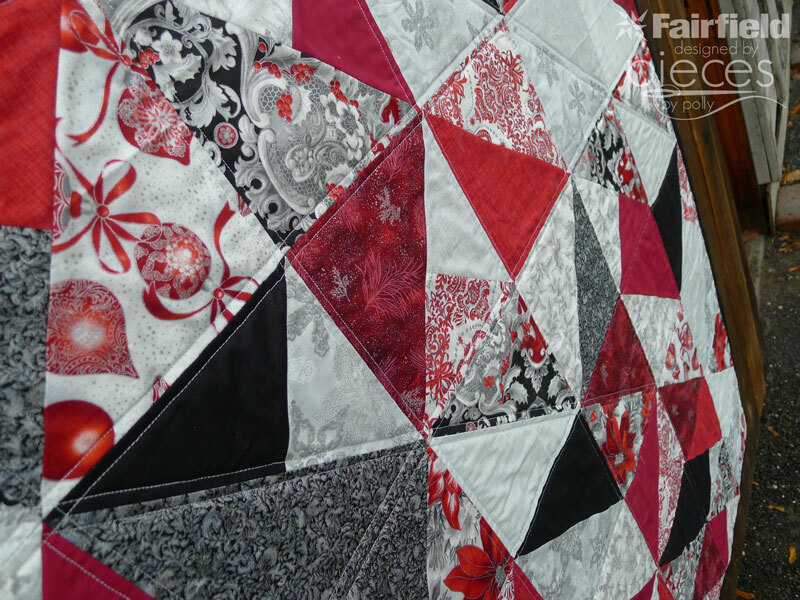 It's full of fabrics with rich metallic highlights, and I love the bold reds and blacks. I love how festive the bundle is while using a slightly different color scheme with the black instead of traditional green. I love red and black for any time of year, and it's even prettier at Christmas. 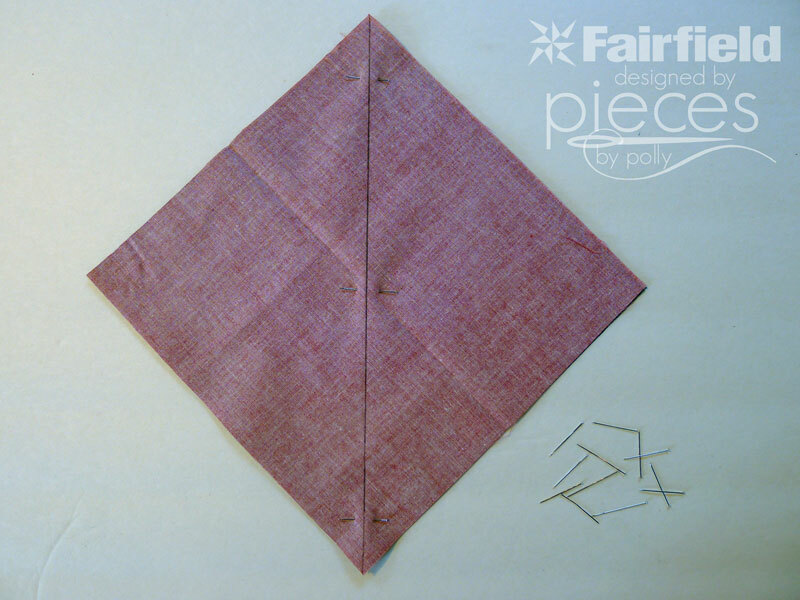 I'm usually more of a width-of-fabric-cuts-type girls, but fat quarters are perfect for making large half-square triangles. Start by opening up your bundle and ironing everything. There were 14 fabrics plus a panel. 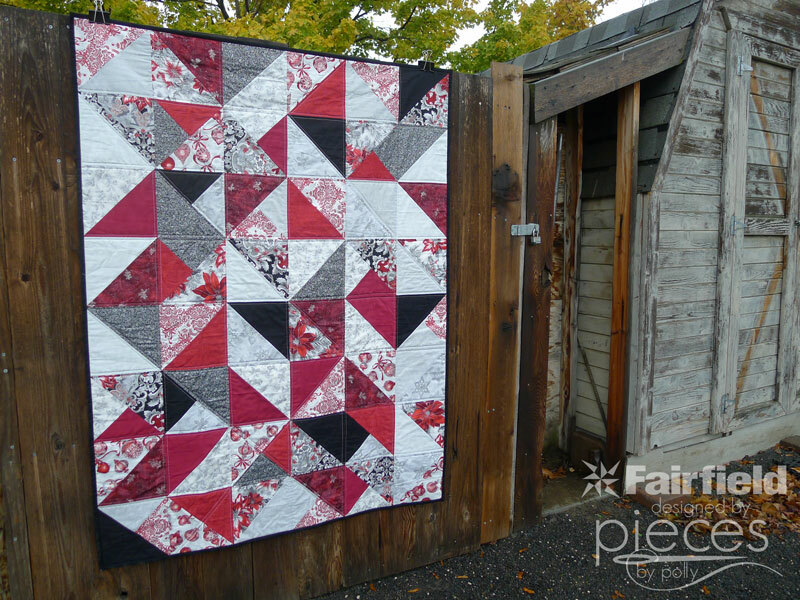 I saved the panel and one of the fat quarters (one with stripes) aside because they weren't going to work well with the half-square triangles. 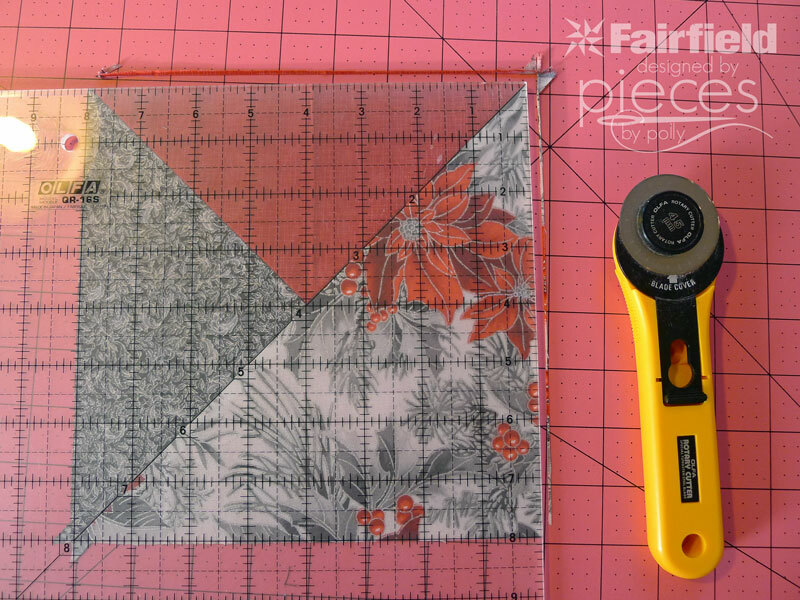 Start by trimming up two sides of your fat quarter. 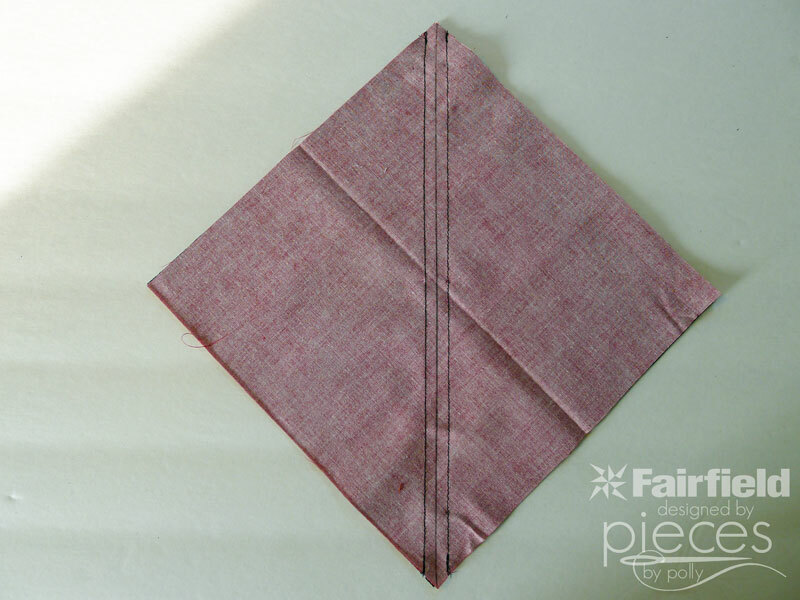 Then based of those two sides, cut an 8 1/2 inch strip of fabric the width of the fat quarter and a 9-inch strip the width of the fat quarter. 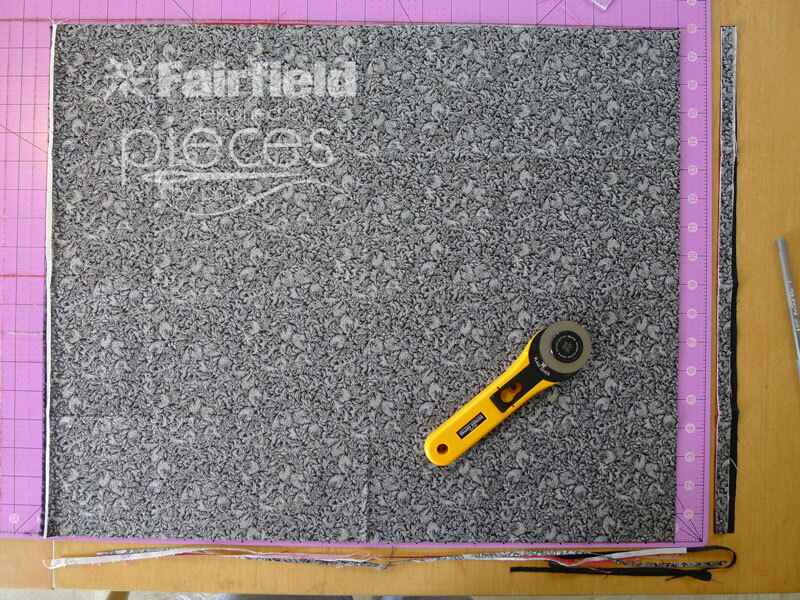 Then from the 9-inch strip, cut a 9 inch square and an 8 1/2 inch square. 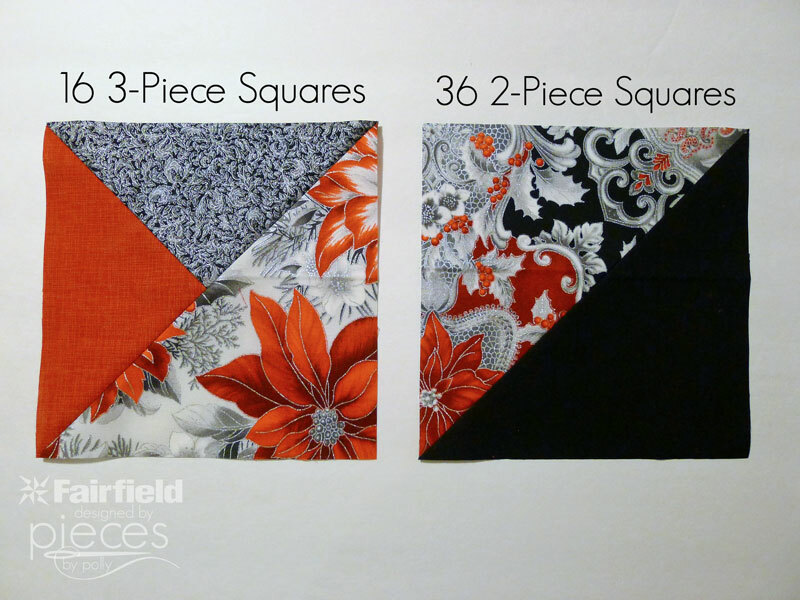 From the 8-inch strip, cut 2 8 1/2 inch squares. 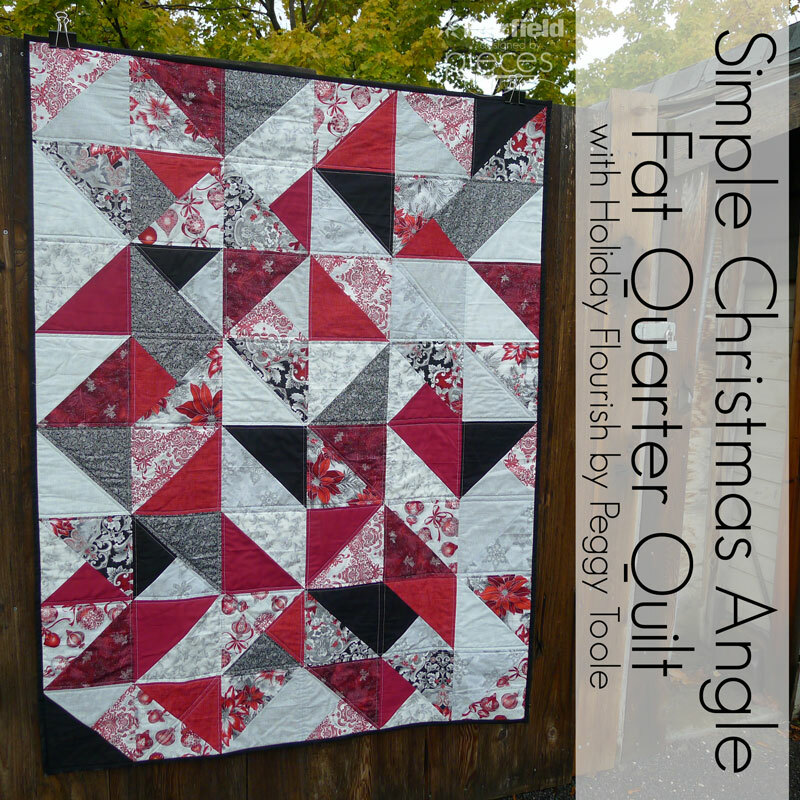 So from each fat-quarter, you should have 3-8 1/2 inch squares and 1 9-inch square. This will also leave you with some delicious scraps you can use for an accent on the back if you want. 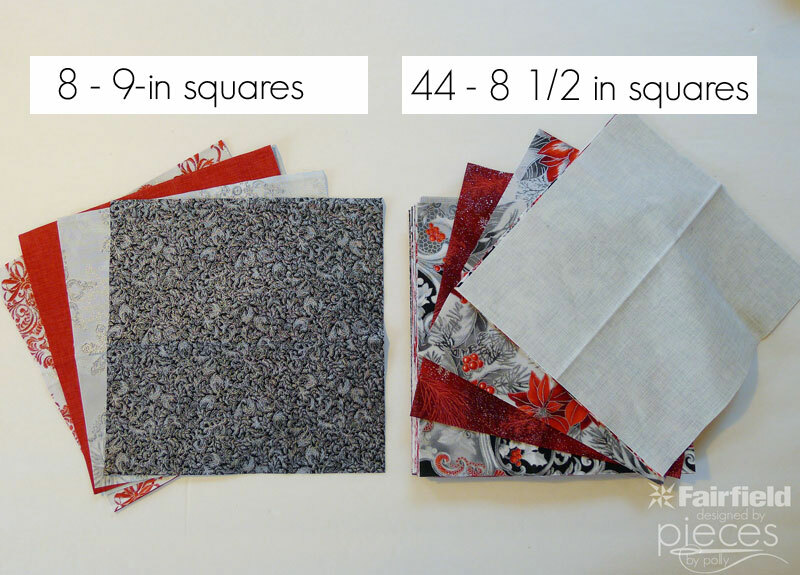 You should end up with a total of eight 9-inch squares and forty-four 8-1/2 inch squares. Now it's time to make some Half-Square Triangles. Start with your 9-inch squares. Pair them up in contrasting sets, so you'll have four sets. Line them up perfectly on top of each other with the RIGHT sides together. 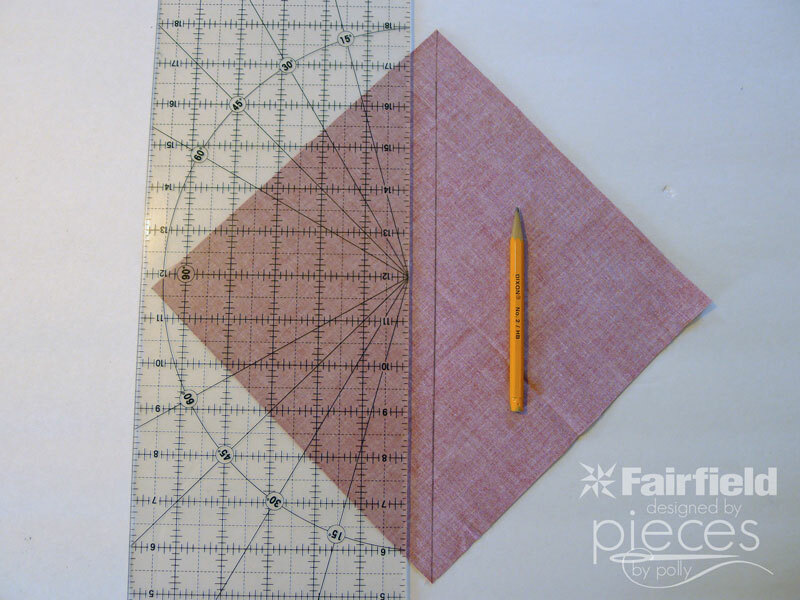 Using your quilting ruler and a pencil, mark the middle of your square through the diagonal. Pin to hold your squares in place. 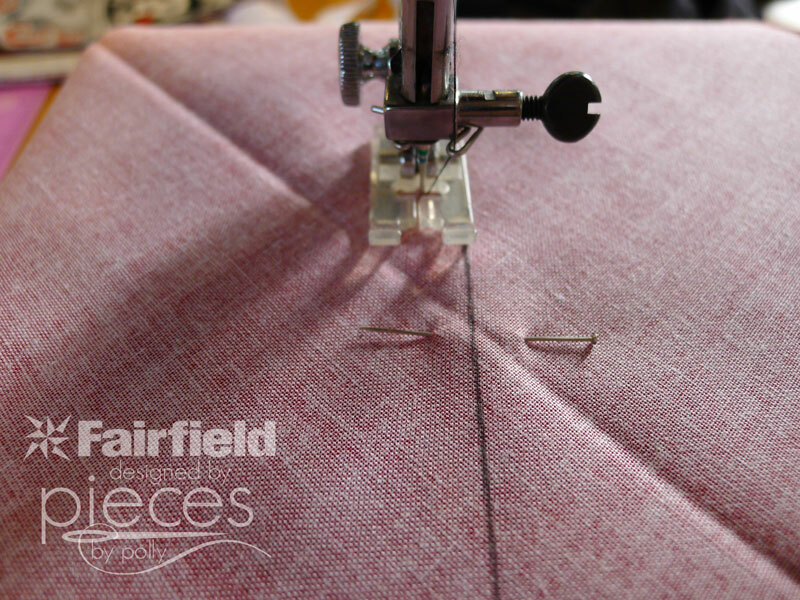 Sew 1/4-inch to each side of your line. DO NOT sew on the marked line. Note the middle line in my pencil mark and the two lines on each side are my stitching with black thread. 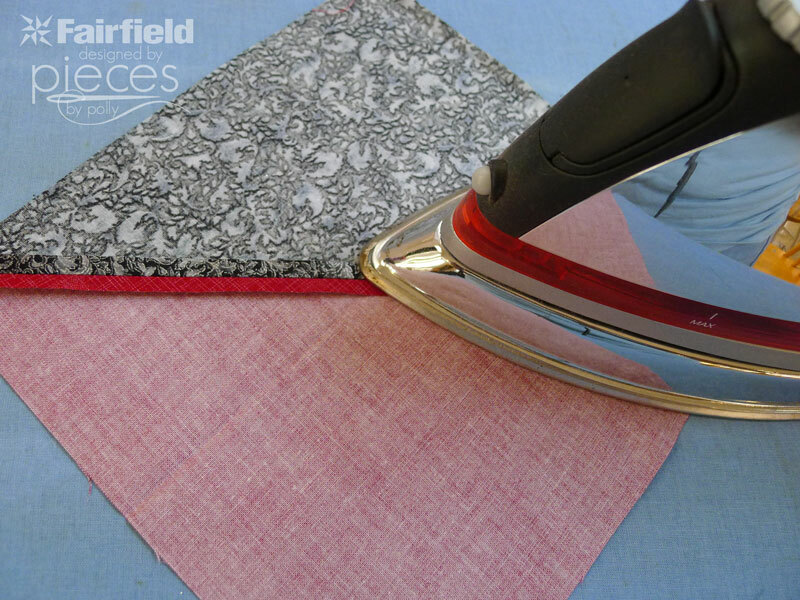 Using your rotary cutter, cut down your marked line. 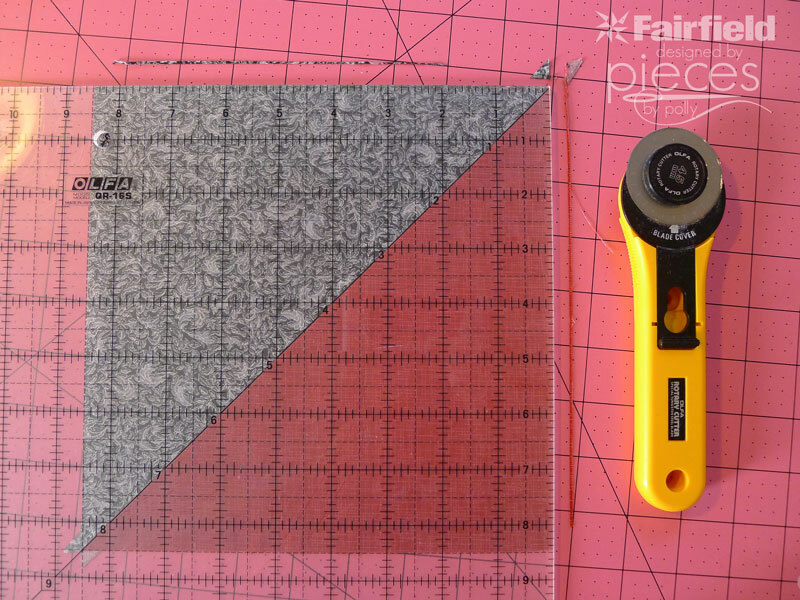 Trim your new squares to be 8 1/2 inches. 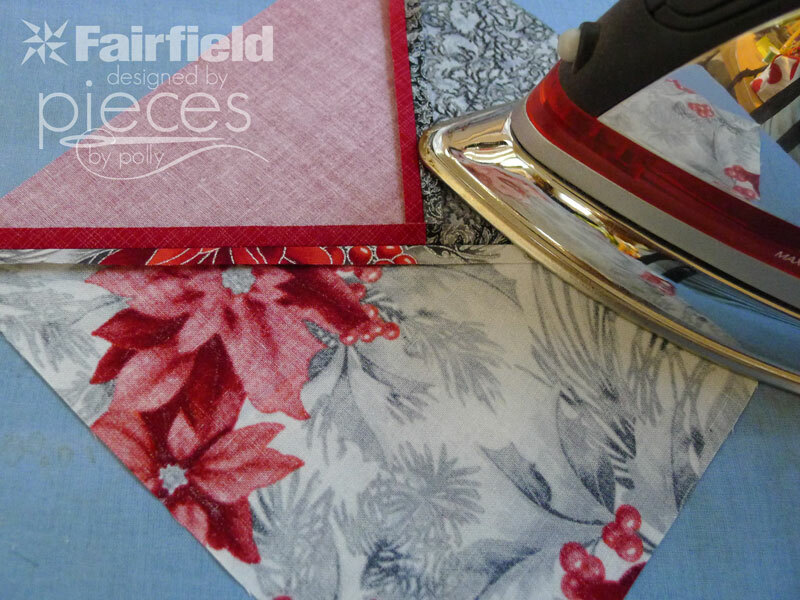 It will seam like you're not hardly cutting anything off, but trimming well will pay off in terms of having your corners match in the finished product. Now take each of the Half-Square-Triangle Blocks you just made and pair them up with one of the plain blocks, preferably one that contrasts a bit. Repeat the process from earlier. 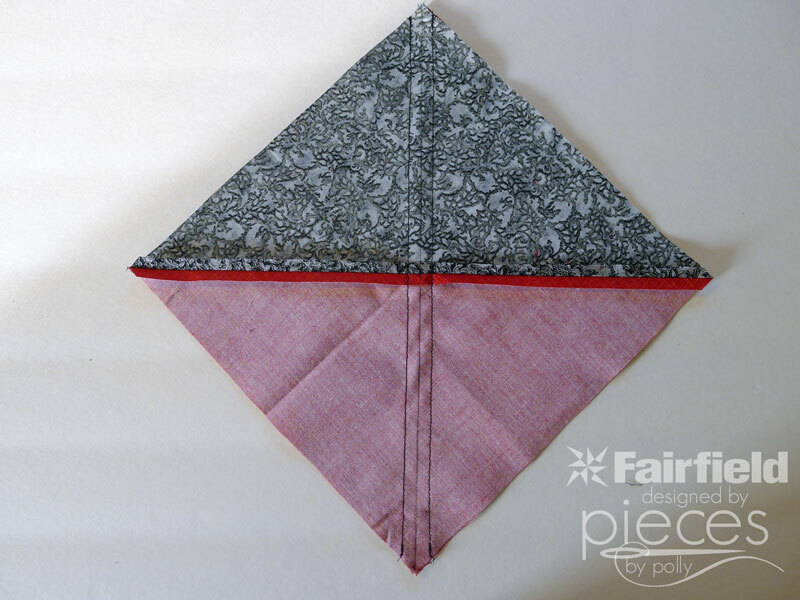 Line them up perfectly and draw a line through the center on the diagonal and pin. Stitch on each side of the line. Cut down the middle. Press open. 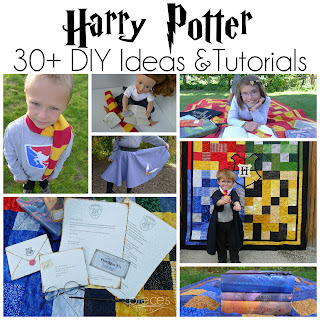 You should have 36 whole 8 1/2-inch squares left. 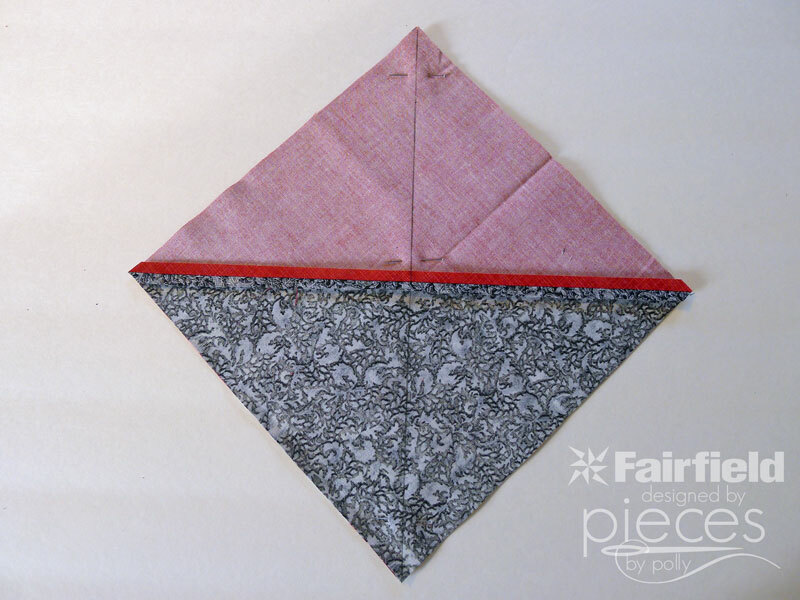 Pair these up in sets of two and make Half-Square Triangle blocks out of them. 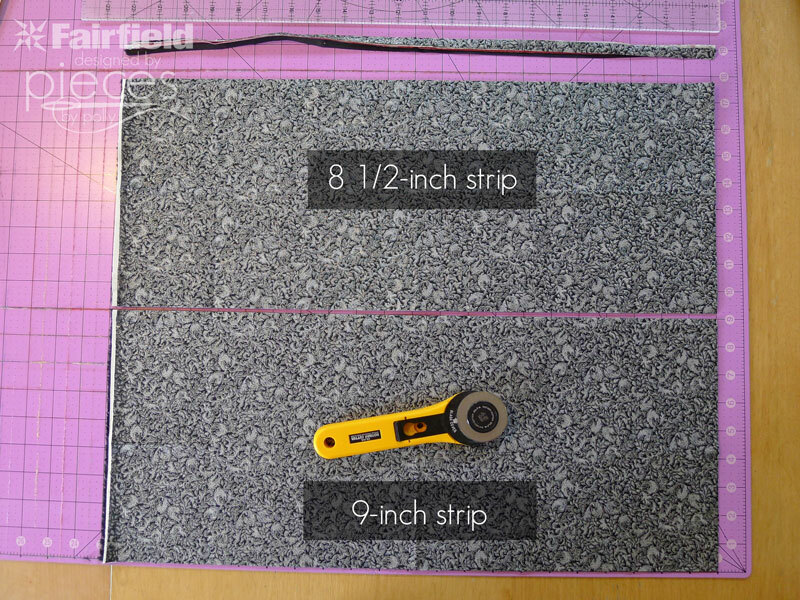 Trim all your finished blocks to 8 inches square. You should end up with a total of 16 3-Piece Squares and 36 2-Piece Squares. This gives you a total of 52. 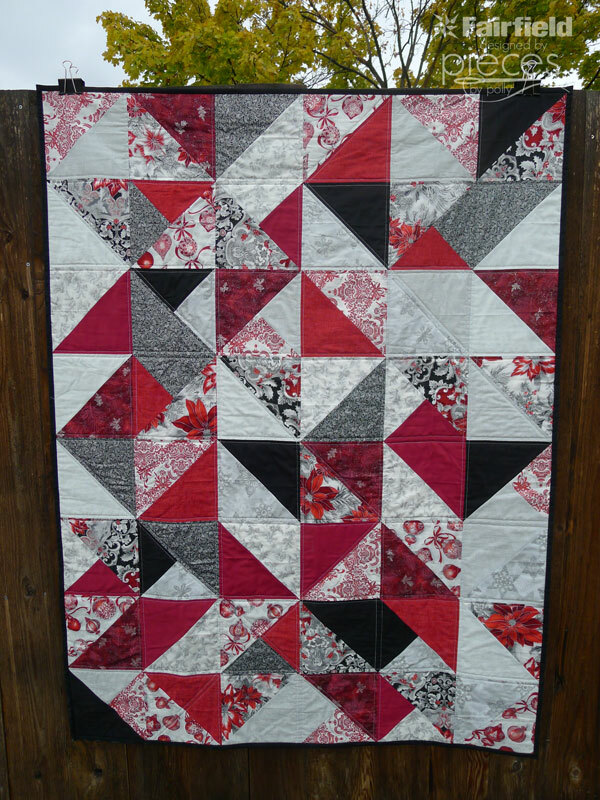 I made my quilt 6 x 8 blocks, so I had 4 blocks left over. Now most of the work is done. Lay out your blocks in a random, but balanced way. Alternate which directions the diagonals go. 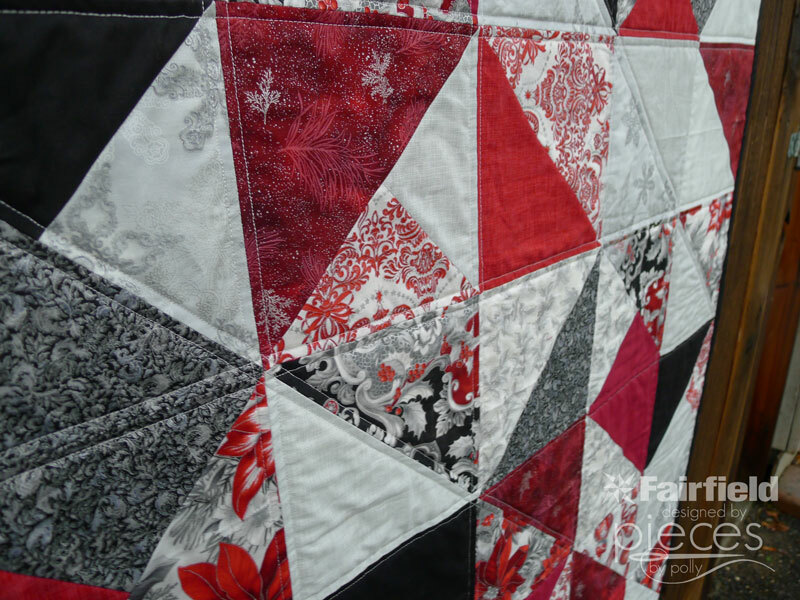 Sew your blocks together and finish your quilt. I used Nature-Fil luxury batting from Fairfield as my batting. It's a blend of bamboo derived rayon and cotton and gives your blanket an extra soft feel. 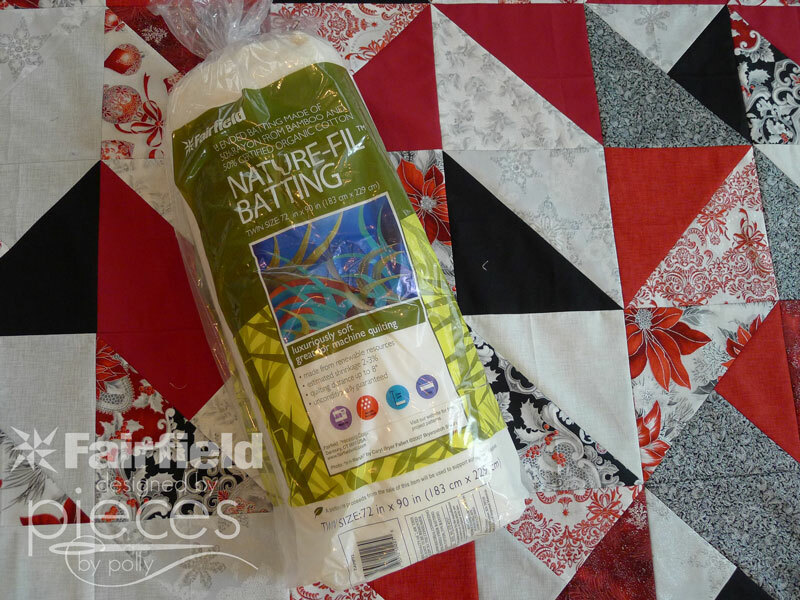 I also love cotton batting, but use the Nature-Fil for my extra special quilts. 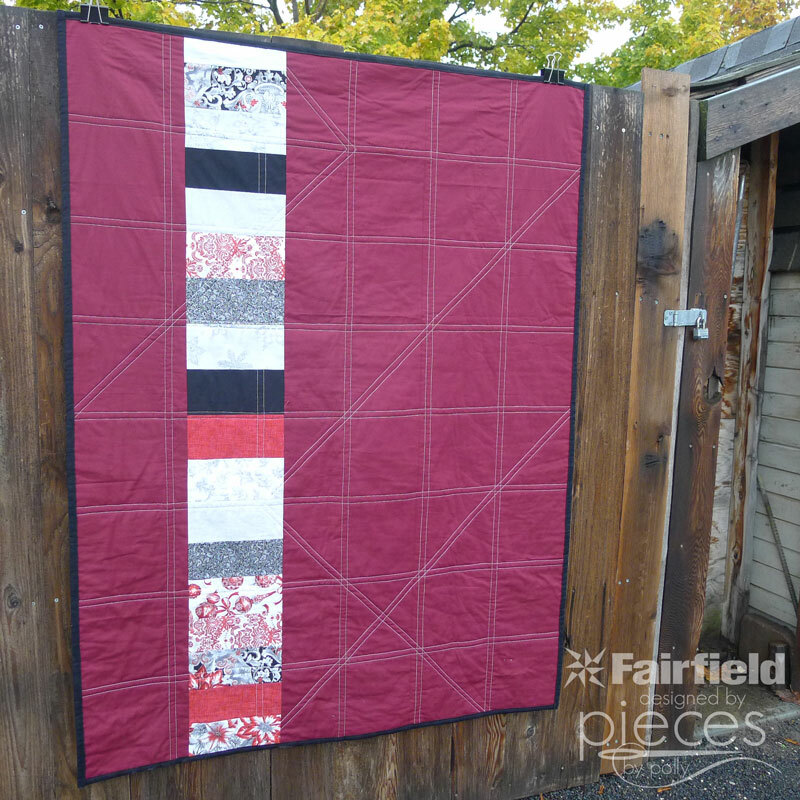 You can use those scrap rectangles to make a fun accent strip on the back of your quilt if you want. I quilted mine on my home machine. I just did some simple quilting 1/4 inch on each side of my block seams. Then I chose a few diagonals to follow to give the back a bit more interest. I am just in LOVE with how this turned out! WOW! You rocked it girl! Very nice and your step outs are fantastic. What a beautiful quit! In in love with that fabric too. Thanks for sharing the pattern with us. 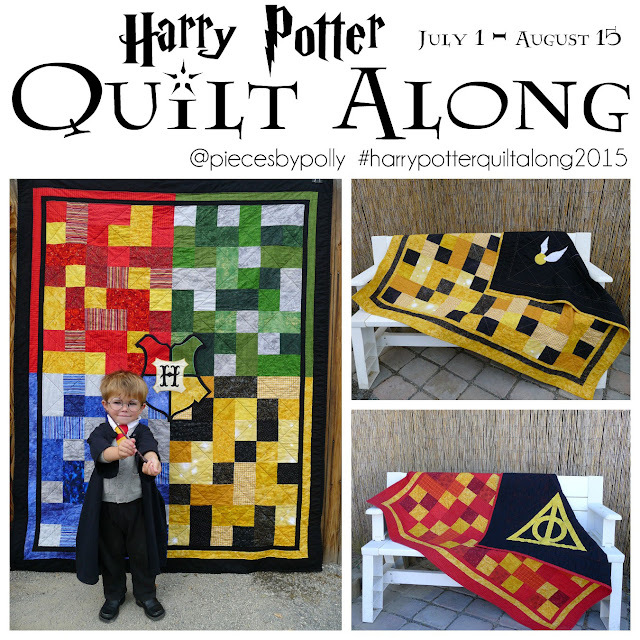 Love your quilt Polly! Your quilting is so striking on the back, too. I didn't know the trick for sewing the triangles before cutting. Love this pattern! Thanks, Polly. The quilt is beautiful. Love the pattern but I have a question. one step states to square block to 8 1/2" and the next one states to square to 8". Which is correct. 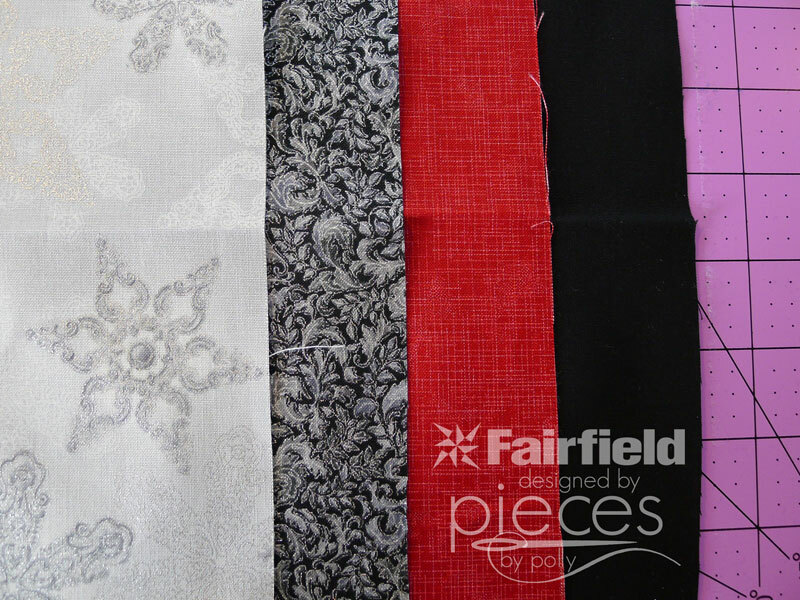 Some of the squares are cut to 9" and some are cut to 8 1/2" to start. The 9" squares become those smaller squares that you see scattered through the quilt. They start out larger because each time they get turned into a triangle, the seam allowance makes the finished square shrink a bit. 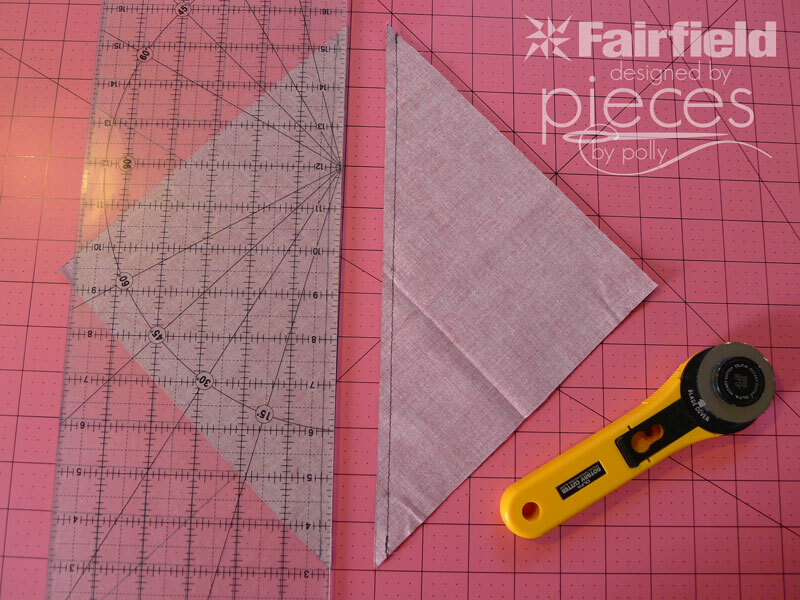 So those squares destined to become the smaller triangles start at 9", then get trimmed to 8 1/2" inches as half-square triangles. Then those 8 1/2" HST blocks get combined with a whole 8 1/2" square and become a blog with one side HST and the other side two quarter square triangles. The blocks in the end will all be 8" before sewn into the whole quilt. Make sense?